In a 19 x 13 glass baking dish, melt butter into bottom of it and set aside. In a large mixing bowl briskly stir together your flour, cinnamon, nutmeg, 1/2 cup of honey and baking powder. Next vigorously stir in your milk until you have a smooth thick batter. Pour batter over the top of the melted butter. 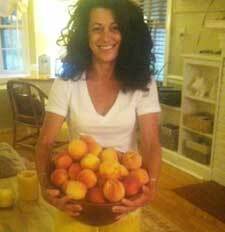 In a saucepan add the fresh chopped skinned peaches, lemon juice, vanilla extract, and 1/2 cup of honey. Heat these ingredients until the honey has completely melted and the peaches are tender and juicy. Next pour the cobbler filling over the top of the batter and even out using a rubber spatula. Put in oven and bake for 40 minutes or until the surface of the cobbler is golden brown. Put your COLD whipping cream in a COLD bowl. Add 1/4 cup maple syrup and whip until fluffy. 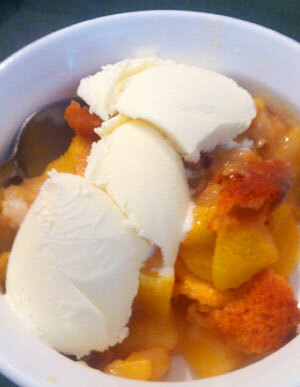 Add to the top of your cobbler and enjoy!